UNITED STATES: Six former workers say being exposed to chemicals at TPI Composites' Iowa plant made them ill -- and they were fired for it. The company denies the claims. Zarpka "Patience" Green is one of six former TPI Composites employees suing the company for what they say are severe injuries caused by chemicals in a blade manufacturing plant in Iowa. Green says she has contact dermatitis, an inflammation resulting from a skin allergy, and that her face also swelled up because of the chemical exposure. She says she now has to shower twice a day and cannot sleep at night. Green alleges that she became sick after applying epoxy resin inside blades in the moulding department at TPI’s plant in Newton, Iowa. She says TPI did issue gloves, paper masks and paper suits, but that the equipment was inadequate and resin would sometimes soak through to her own clothes. The 36-year old alleges that the same day her skin injuries were diagnosed, TPI fired her, saying it could no longer accommodate her health needs. Her complaint, filed at Iowa district court in Jasper County, accused TPI of a "systematic practice of hiring healthy employees and then terminating them from employment after their employees sustained a chemical injury." Green’s case was to go to jury trial in September, but, along with the five other similar suits, has been stayed because one of the defendants, Insurance Company of the State of Pennsylvania, claims that it is immune under Iowa law. The immunity issue could take several months to resolve, said Green’s lawyer, Matt Sahag. 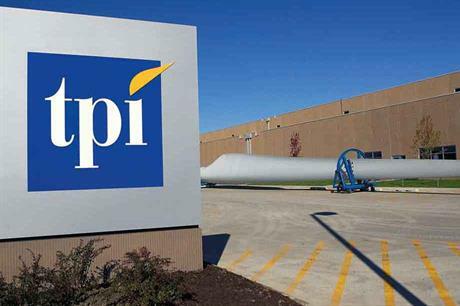 TPI, the largest US-based independent manufacturer of wind blades, denies all the allegations and says that employee safety is its "first core value". Lawyers for the company are contesting the suits in court. "During the last several years, we have made numerous enhancements to our safety programme and are committed to the continuous improvement of our safety practices and procedures," said Thomas Castle, TPI’s senior vice president of North American wind operations, in a written statement to Windpower Monthly. TPI had a 13% share of the global wind-blade market in 2017 globally, up from 9% in 2016, according to a June 2018 investor presentation. The firm expects to deliver around 2,500 blade sets in 2018, according to its latest quarterly conference call. GE Renewable Energy is a primary customer at the Iowa facility. GE refused to comment on the litigation. Other TPI customers include Vestas, Siemens Gamesa, Nordex Acciona and Senvion (see chart). TPI also has blade plants in China, Turkey and Mexico. TPI’s president and CEO, Steve Lockard, is also chair of the board of directors of the American Wind Energy Association (AWEA). Meanwhile, TPI is contesting all of the citations issued recently by Iowa occupational health and safety officials for violations at the same blade manufacturing plant. Forty-three citations were issued to TPI in June by the Iowa Occupational Health and Safety Administration (OSHA) and the company was fined $154,524, which is apparently regarded a moderate amount. The OSHA issued two of the citations because workers were potentially exposed to airborne chemicals and fibreglass dust. The state also found that TPI did not select the appropriate "personal protective equipment". The citations for chemical exposure are notable because of the lawsuits. Other citations were for violations such as trip or fall hazards, or improper storage of flammable liquids. "While we are unable to discuss details relating to ongoing skin allergy litigation and the Iowa OSHA proceeding, we have substantive disagreements on the facts," TPI’s Castle told Windpower Monthly. The wind industry has built an image of itself as clean and green, and workplace violations involving hazardous chemicals are not known to be common. Meena Aladdin, a PhD health researcher and toxicologist with watchdog Public Citizen, said the OSHA fines were a step in the right direction in holding a company responsible for worker safety. She noted that epoxy resins can irritate the skin or be inhaled, and are made from bisphenol A (BPA), which is known as an endocrine disruptor and has been linked to infertility and other reproductive effects. Iowa OSHA investigated the Newton plant after a regional newspaper, the Des Moines Register, ran a major investigative report on the workers’ alleged chemical injuries. The paper said the agency logged more than 300 cases of skin injuries at the plant from 2008 to 2016. Question of the Week: Does the media overreact to turbine failure?